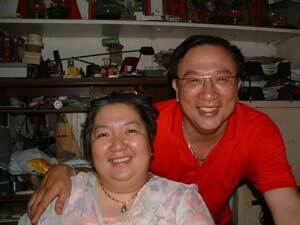 Lydia Yongco: Filipino-Chinese businesswoman and owner of McSherry Pension House in Cebu City. STREETBUZZ: Lydia, can you tell us a little about your life? LYDIA YONGCO: I was born in Butuan City, Mindanao, and I have one brother and two sisters. My family are businesspeople, we have retail stores there: grocery and general merchandise. I had a happy childhood, and a great education. I came to Cebu for my high school, then I went to Manila for my college. I received a doctor of optometry at the Centro Escolar University. Now I work at MEPZ (Mactan Export Processing Zone) as an industrial optometrist, I work with several companies there. I give eye exams to the workers, write them prescriptions for eyeglasses and so forth. STREETBUZZ: So after you finished your school in Manila, then what? How did you meet Gino? LYDIA YONGCO: I returned to Butuan, and I practiced my career and also helped my family with the grocery stores. Then I met Gino. Actually, our families introduced us. He was living in Cebu at that time, I was in Butuan. After we got married, I moved here to Cebu. At first, I practiced my career, and Gino worked in the tuna factory. Then we had the opportunity to buy the McSherry. At that time it was called the DeMetria Lodge, it was very simple, just apartment units. We got it for a very good price, then we borrowed money from the bank to renovate it. Now, it's fully operated in the classification of pernsion house. Aircon and electric fan available. We keep on improving it. STREETBUZZ: So what can you say about owning the McSherry? LYDIA YONGCO: I feel blessed by God for giving us the opportunity. You know, I really just feel blessed. We have guests that are professional and businessmen, we seldom get troubles from foreign guests maybe because the Europeans / Americans are very civil and cultured. STREETBUZZ: Are you and your husband religious? LYDIA YONGCO: Yes, I'm protestant christian, and Gino is a catholic. It's a big part of our lives, like I said I feel blesssed for the opportunites in my life, it's because of God. STREETBUZZ: How about your family? Do you want them to stay here or go overseas? LYDIA YONGCO: We have four children, one girl and three boys: Mary McSherry, Glenn, James, and Bill. We hope they will stay here in the Philippines, not overseas. But we would like them to have an education overseas, like in the USA, because it's more advanced. So when they come back to the Philippines they will be the best n their chosen careers. STREETBUZZ: What's your opinion about the USA? Have you been there? LYDIA YONGCO: Yes, I visited there. I think the Americans are blessed because they have the best in the world. Best food, best cars, best homes, best education. They have opportunities to make money. It's like if you go to the grocery store there and buy a banana, they are all perfect. There, they wouldn't even sell the food like we have here, where it's not so perfect. You know, I went to the Grand Canyon, it was so beautiful. I went to Disneyland, I was....how can I describe it? I was overwhelmed, that's it. It's like you're in a dream, it's hard to distinguish reality from a dream. The only thing I don't like there, the people have no time to talk to each other, they're so busy with their work. STREETBUZZ: What about the future of the Philippines? I'm the interviewer, so I can give you my idea and then ask what you think. In my opinion, the Philippines is headed for a big disaster: the population is increasing at almost 3% per year, but the food is getting less because they're putting buildings in the rice fields and the fish are disappearing because of the dynamiting and overfishing. I can't imagine things will just continue as they are now, kind of just going along peacefully. In ten or twenty years, well, I'm really afraid for the future here. What do you think about that? LYDIA YONGCO: We will survive. I think life will go on. Everything will stay more or less the same, I'm not worried. Filipinos are very pliant, like bamboo. We will bounce back. They can do with less, you know? They're not so ambitious, not so hard working, they can survive with less. We are peace-loving people and god-fearing too. But as a nation we will be left behind by our neighbors, like Vietnam and by Cambodia. STREETBUZZ: Any closing comments, suggestions for young Filipinos? 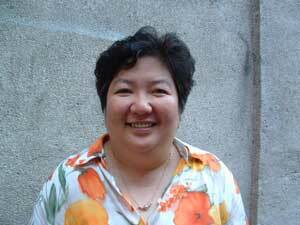 LYDIA YONGCO: I hope people will live peacefully and enjoy life. For the children: study hard, work hard, and love our country the Philippines. McSherry staff Cathy, Prime, Loretta and Gino.